Scarlet and Stripes - An Outfit Post - Sugar, Darling? I'm not sure ﻿if you saw, but a month or so ago I entered a blogger competition run by MS SVG to win a voucher for their website. I had to choose a piece from their website and style it adding accessories and shoes. Well, I actually won the contest much to my delight and therefore had a nice £25 voucher to spend on their website, luckily enough just in time for when their sale began! 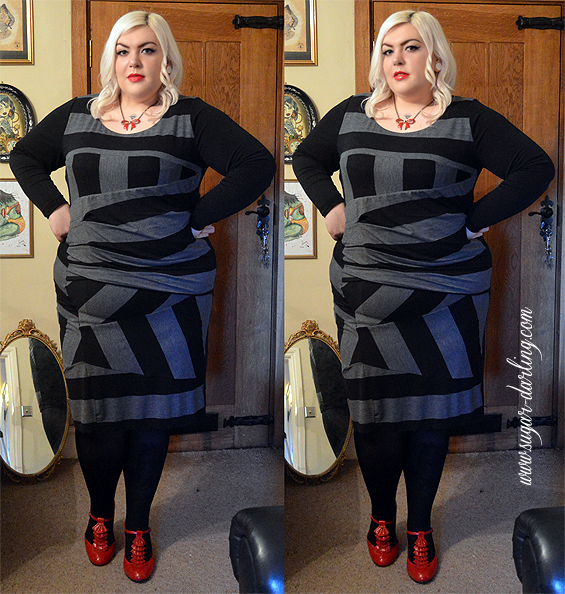 I chose this lovely striped dress from an amazing brand which is new to me called Mat. Fashion. 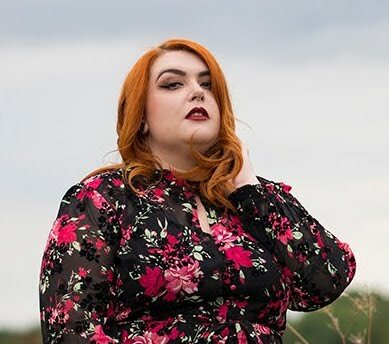 Check out their website, they have some beautiful pieces in their collections which are so unusual and include some lovely prints and dramatic cuts and colours. The dress itself is really nice made of soft stretchy jersey like striped fabric cut into panels and pieced together to make this gorgeous design complete with drape detailing over the waist and tummy. I chose it to wear for work and it really is perfect for the office. The long sleeves are great for this colder weather and the length is bang on for me sitting just under my knee. There is a very pretty detail of a teeny metal heart stamped with the mat. logo sewn in place at the back of the neck - such a pretty detail and it lets you know that you have a designer item in your wardrobe. I chose size L which says is equivalent to a 20-22 - I would usually wear a 24 in this more fitted style of dress so was a little worried that it would be a bit too tight but I think it's ok, maybe just showing my tum a little more than I would usually like but is bang on for the sizing that it says it is. Mat. Asymmetric Striped Dress - MS SVG - Currently £40 in the sale! I'd love to try some more pieces from Mat. Fashion, have any of you got any other pieces by them?